The 2008 One Pound Coin. The reverse shows the Ornamental royal arms which represents the United Kingdom designed by Eric Sewell. 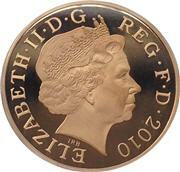 The Obverse is the portrait of Queen Elizabeth II by Ian Rank-Broadley. The edge inscription is DECUS ET TUTAMEN which means 'An ornament and a safeguard'. Mintage: 3,910,000 (may include coins issued as part of a set). Minted at The Royal Mint. Elizabeth II was in her 56th year as Queen. George W Bush is U.S. President. Olympics are in Beijing, China. The main currency of the UK, the GBP £1 coin replaced the previous £1 banknote in April 1983. The 2008 One Pound Coin - Royal Arms (a British one pound (£1) coin) is a denomination of the pound sterling. Its obverse bears the Latin engraving "Dei Gratia Regina" meaning, "By the grace of God, Queen" and FD meaning "Defender of the Faith." The current standard reverse, featuring the Royal Shield, was introduced in 2008. In addition to the standard reverse one or two new designs are minted each year. The coin replaced the Bank of England £1 note, which ceased to be issued at the end of 1984 and was removed from circulation on 11 March 1988, though still redeemable at the Bank's offices, like all English banknotes. One-pound notes continue to be issued in Jersey, Guernsey and the Isle of Man, and by the Royal Bank of Scotland, but the pound coin is much more widely used. The round coin is made in Nickel-brass (70% Cu, 24.5% Zn, and 5.5% Ni). 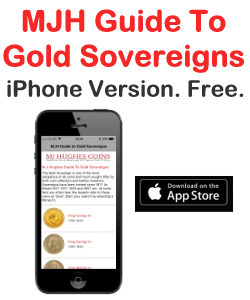 Most years there has been a variant as silver, piedfort silver, gold and sometimes platinum. 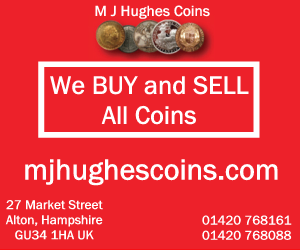 At 31 March 2016 it was estimated that there were 1,671,328,000 pound coins in circulation. The Royal Mint estimated in 2014 that 3.04% (about 47 million) were counterfeit and mainly because of this it was decided to change the design. Note that even some of the uncirculated coins have been counterfeited so this is still a problem for collectors. The final round coins were minted in December 2015. Their replacement, a new 12-sided design, was introduced from 28 March 2017 onwards. It is of a similar 12-sided shape to the pre-decimal brass threepence coin, is roughly the same size as the current £1 coin and is bimetallic like the current £2 coin. The new design is intended to make counterfeiting more difficult, via an undisclosed hidden security feature, called 'iSIS' (Integrated Secure Identification Systems). To reach the initial production of 1.5 billion pound coins to replace the exsiting coins the Royal Mint used ten presses 24×7 making 140,000 coins per hour. It takes a long time to restock the entire country and that’s why the new coins are dated 2016 and 2017 despite not being legal tender until March 2017. The old round one pound coin ceases to be legal tender on 15 October 2017. The Royal Mint is the designated place for the UK to mint coins. It dates back well over 1000 years and is a Government-owned company. Formed in the reign of Alfred the Great about the year 886, it moved to the Tower of London in 1279 and remained there for over 500 years. The Master of The Royal Mint has included famous figures such as Sir Isaac Newton. Since 2010 it has operated as Royal Mint Ltd, a company owned by HM Treasury, under an exclusive contract to supply all coinage for the UK although it also produces medals and coins for other countries. It is currently located at Llantrisant, Wales. Queen Elizabeth II is the current and longest reigning monarch ever. Born on 21 April 1926 to King George VI and Elizabeth Bowes-Lyon, she became Queen in 1952 and her Coronation was on 2 June 1953. Queen Elizabeth II has issued many coins and was monarch during decimalisation. The United Kingdom (UK) is the Union of England, Scotland, Wales and Northern Ireland. It is often refered to as Great Britain (GBR). It has a long, rich history. It's orignal coinage was Pounds, Shillings and Pence but since decimalisation on 15 February 1971, it is £1 = 100p, that is One Pound = 100 pence. The coinage of the UK is also a long history, the Royal Mint being established as long ago as 886AD when coins were hammered. Today there is perhaps 30 billion coins in circulation, and many (numismatic) collectors coins and sets are issued frequently in gold, silver and other metals.